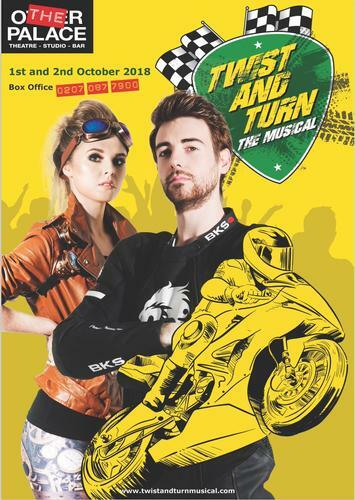 Twist and Turn is a new musical set in the Isle of Man. Robbie Skelton (Simon Gordon) is a World Superbike Champion. One day, he comes back, and his return brings back old tensions with his sister Charlotte (Georgina Castle), his father AJ (Neil Stewart) and his group of old friends. I always enjoy watching new material at the beginning of its life. Twist and turn is a good show with good songs and some laughs: Tony Gibbs is the producer, composer and writer, Simon Gordon the director (also as the lead), while Mark Smith is the musical director. The cast is strong with very good performances from all of them. There are too many characters in the story, and this results in an overcrowded stage (The Studio of the Other Palace) and some confused storylines. It is not clear the background of the characters, therefore it is difficult to understand what it is behind their actions. Why Robbie is back? Why has he become such a hard person and turns to a different and apologetic man all of a sudden? What are the reasons of all the tensions around the group? With this lack of insight and the confused storyline, it can be difficult to empathize with them, especially Robbie. He’s the hero who opens the show and somehow succeeds in bringing his community back together, but his passion for racing, his backstory and his strong need for winning (even at the expense of his friends and family, we hear) are left quite unexplained. One feels there is much more to the emotional life and motivations of this character that never make it to either a scene or a song. We leave the theatre not being sure we encountered this character as fully as we would have liked to. Still, his journey from champion to man is an endearing one and has touching moments. Next to and intertwined with his storyline are those of the town’s people and Robbie’s loved ones. They are well achieved and bring humour and heart to the story, although their quantity and density makes them hard to follow, and the story ends too suddenly in a happy ending with long standing conflicts resolved (how?). On the other hand the music of Twist and Turn is good. Very good. Winner is a good opening number. Alive (with a wonderful Jane Milligan) is catchy and fun. Don’t tell me know is an intense and emotional ballad made even more beautiful by the acoustic version. Who really steals the scene is Tom Berkeley. His acting is so spontaneous and his voice so fascinating that he captivated the audience with the wonderful I need your love tonight and The song that I sing. There is some work to do, in Twist and Turn, especially on the clarity of the plot and on giving more depth to the characters and the storylines, but musicals are mostly about music, and with that soundtrack, Twist and Turn has a big potential.